During summer the weather is hot and this is the reason BETAT Casino have done their best to make sure that you hardly go outside to get your skin burnt by the scorching sun. To keep you away from the sun, they have added a couple of games to their gaming database. This will make sure that you have much fun when you’re inside your house. 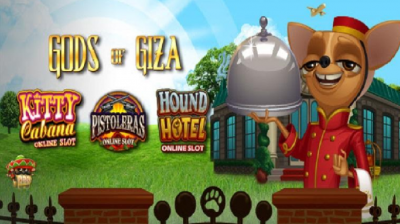 The new BETAT games include Gods of Giza, Hound Hotel, Kitty Cabana and pistol-eras in a myriad of many more. In this post, I will take you through an overview of what you are to expect from the different games. This is a game cat lovers will adore. The game houses the feline decors on the reels and a background finely crafted by the Microgaming developers. The slot has 5 reels, 25 paylines and rewarding features like free spins, wilds, and scatters among many more. This is an amazing slot that will make you love the cowgirl capers. You will definitely love the Wild West theme incorporated in this slot. This microgaming slot has 5 reels and 25 paylines. There is a bonus game, scatters, free spins and wild symbols to the slot. As the cat lovers were considered, the dog lovers were not left out. There is a game for them too. The Hound Hotel is a 5 reel and 25 paylines slot that houses all features you would expect in a Microgaming powered slot. The slot has been done by Genesis Gaming. It will take you back to the ancient Egypt. This is an era filled with mystery and treasures. All this will be brought to life on the slot’s screen. The slot has 4 reels, gives you 20 unique ways to win and has a bonus game powered by free spins. You will definitely be lured into the moment by the Egyptian-y music that might get you walking like an Egyptian after playing the slot. Slotty Vegas is known to be a heaven for slot lovers. The casino is an entity by the same management as BETAT Casino. The casino is launching their Hall of Champions Tournament. The slot is here to make sure that you have an incredible moment this summer. The slot makes it possible for the players to compete for cash prizes and free spins. Slotty Vegas does not stop at this, they continue to build on their database and player experience with an upgrade of their Supercharged system.